Recall from Revelation 10:8-11, the Lord commanded John to eat a little book that contains prophecies that cover events in the last half of the Tribulation. These prophecies are covered in two interludes. 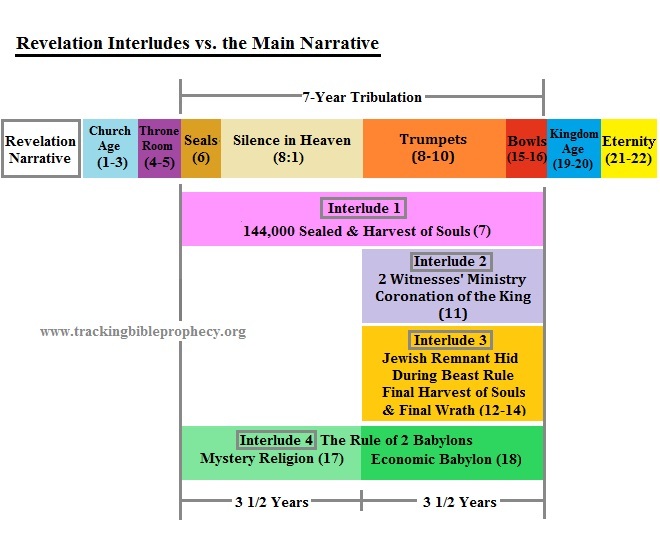 As discussed in the "Revelation Introduction," an interlude gives us more information or a different perspective to the narrative. In other words, an interlude is a background story to the narrative, with clear indications that each interlude reaches back or forward in time, and generally returns to where the primary narrative left off. 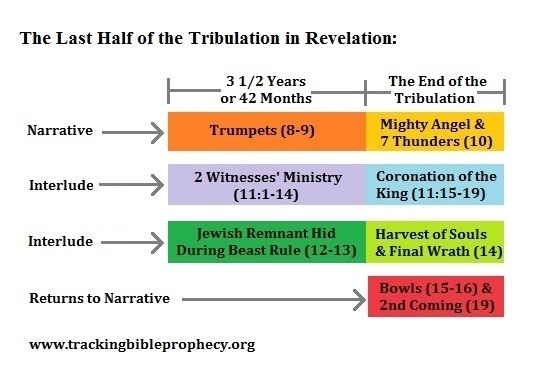 Chapter 14 concludes the interlude which covers events in the last half of the Tribulation described in Revelation 12 and 13 and covers the final harvest of souls and God's final wrath before Jesus returns to Earth at the end of the Tribulation. Revelation 14:1 - Then I looked, and behold, a Lamb standing on Mount Zion, and with Him one hundred and forty-four thousand, having His Father's name written on their foreheads. Revelation 14:3 - They sang as it were a new song before the throne, before the four living creatures, and the elders; and no one could learn that song except the hundred and forty-four thousand who were redeemed from the earth. Revelation 4:2, 4, 6 - Immediately I was in the Spirit; and behold, a throne set in heaven, and One sat on the throne.... Around the throne were twenty-four thrones, and on the thrones I saw twenty-four elders sitting, clothed in white robes; and they had crowns of gold on their heads.... And in the midst of the throne, and around the throne, were four living creatures full of eyes in front and in back. Acts 7:55-59 - But he, being full of the Holy Spirit, gazed into heaven and saw the glory of God, and Jesus standing at the right hand of God, and said, "Look! I see the heavens opened and the Son of Man standing at the right hand of God!" Then they cried out with a loud voice, stopped their ears, and ran at him with one accord; and they cast him out of the city and stoned him. And the witnesses laid down their clothes at the feet of a young man named Saul. And they stoned Stephen as he was calling on God and saying, "Lord Jesus, receive my spirit." Revelation 5:6 - And I looked, and behold, in the midst of the throne and of the four living creatures, and in the midst of the elders, stood a Lamb as though it had been slain, having seven horns and seven eyes, which are the seven Spirits of God sent out into all the earth. Isaiah 53:5-7 - But He was wounded for our transgressions, He was bruised for our iniquities; the chastisement for our peace was upon Him, and by His stripes we are healed. All we like sheep have gone astray; we have turned, every one, to his own way; and the LORD has laid on Him the iniquity of us all. He was oppressed and He was afflicted, yet He opened not His mouth; He was led as a lamb to the slaughter, and as a sheep before its shearers is silent, so He opened not His mouth. John 1:29 - The next day John saw Jesus coming toward him, and said, "Behold! The Lamb of God who takes away the sin of the world!" 1 Peter 1:18-19 - Knowing that you were not redeemed with corruptible things, like silver or gold, from your aimless conduct received by tradition from your fathers, but with the precious blood of Christ, as of a lamb without blemish and without spot. Psalms 82:1-8 - A Psalm of Asaph. God stands in the congregation of the mighty; He judges among the gods. How long will you judge unjustly, and show partiality to the wicked? Selah Defend the poor and fatherless; do justice to the afflicted and needy. Deliver the poor and needy; free them from the hand of the wicked. They do not know, nor do they understand; they walk about in darkness; all the foundations of the earth are unstable. I said, "You are gods, and all of you are children of the Most High. But you shall die like men, and fall like one of the princes." Arise, O God, judge the earth; for You shall inherit all nations. Isaiah 3:13 - The LORD stands up to plead, and stands to judge the people. Ezekiel 20:35-38 - And I will bring you into the wilderness of the peoples, and there I will plead My case with you face to face. Just as I pleaded My case with your fathers in the wilderness of the land of Egypt, so I will plead My case with you," says the Lord GOD. "I will make you pass under the rod, and I will bring you into the bond of the covenant; I will purge the rebels from among you, and those who transgress against Me; I will bring them out of the country where they dwell, but they shall not enter the land of Israel. Then you will know that I am the LORD." Jeremiah 25:30-33 - "Therefore prophesy against them all these words, and say to them: 'The LORD will roar from on high, and utter His voice from His holy habitation; He will roar mightily against His fold. He will give a shout, as those who tread the grapes, against all the inhabitants of the earth. A noise will come to the ends of the earth - for the LORD has a controversy with the nations; He will plead His case with all flesh. He will give those who are wicked to the sword,' says the LORD." Thus says the LORD of hosts: "Behold, disaster shall go forth from nation to nation, and a great whirlwind shall be raised up from the farthest parts of the earth. "And at that day the slain of the LORD shall be from one end of the earth even to the other end of the earth. They shall not be lamented, or gathered, or buried; they shall become refuse on the ground." The scene on Mount Zion takes place at the end of the Tribulation, right before the Lord returns to judge the nations, so it makes sense that He is "standing," as He is about to return to earth. The Emblem of Holiness was placed on Aaron's forehead (Exodus 28:38). This symbolized acceptance before the Lord. A mark was put upon the foreheads of those in Jerusalem who mourned for the wickedness of Jerusalem. They were spared in a time of terrible judgment (Ezekiel 9:4). The Bible indicates that a person's character can be determined by observing the forehead. A set forehead indicates opposition, defiance, and rebellion (Jeremiah 3:3). Hardness of the forehead indicates determination to persevere (Isaiah 48:4; Ezekiel 3:8-9). Job 31:35 - Oh, that I had one to hear me! Here is my mark. Oh, that the Almighty would answer me, that my Prosecutor had written a book! Ephesians 2:13-16 - But now in Christ Jesus you who once were far off have been brought near by the blood of Christ. For He Himself is our peace, who has made both one, and has broken down the middle wall of separation, having abolished in His flesh the enmity, that is, the law of commandments contained in ordinances, so as to create in Himself one new man from the two, thus making peace, and that He might reconcile them both to God in one body through the cross, thereby putting to death the enmity. Colossians 2:13-14 - And you, being dead in your trespasses and the uncircumcision of your flesh, He has made alive together with Him, having forgiven you all trespasses, having wiped out the handwriting of requirements that was against us, which was contrary to us. And He has taken it out of the way, having nailed it to the cross. Exodus 12:22-23 - And you shall take a bunch of hyssop, dip it in the blood that is in the basin, and strike the lintel and the two doorposts with the blood that is in the basin. And none of you shall go out of the door of his house until morning. For the LORD will pass through to strike the Egyptians; and when He sees the blood on the lintel and on the two doorposts, the LORD will pass over the door and not allow the destroyer to come into your houses to strike you. John 6:27 - "Do not labor for the food which perishes, but for the food which endures to everlasting life, which the Son of Man will give you, because God the Father has set His seal on Him." 2 Timothy 2:19 - Nevertheless the solid foundation of God stands, having this seal: "The Lord knows those who are His," and, "Let everyone who names the name of Christ depart from iniquity." Jeremiah 3:3 - Therefore the showers have been withheld, and there has been no latter rain. You have had a harlot's forehead; you refuse to be ashamed. Revelation 17:5 - And on her forehead a name was written: MYSTERY, BABYLON THE GREAT, THE MOTHER OF HARLOTS AND OF THE ABOMINATIONS OF THE EARTH. Revelation 13:16-17 - He causes all, both small and great, rich and poor, free and slave, to receive a mark on their right hand or on their foreheads, and that no one may buy or sell except one who has the mark or the name of the beast, or the number of his name. Hebrews 7:24-25 - But He, because He continues forever, has an unchangeable priesthood. Therefore He is also able to save to the uttermost those who come to God through Him, since He always lives to make intercession for them. Revelation 22:3-4 - And there shall be no more curse, but the throne of God and of the Lamb shall be in it, and His servants shall serve Him. They shall see His face, and His name shall be on their foreheads. This is in contrast to the followers of the beast, who take the mark of the beast on their forehead as a sign of their allegiance and devotion to the beast as his servants, as discussed in Revelation 13:16. The seal with the Father's name also shows that He protects them from His judgments during the Tribulation. But the Tribulation judgments do not end until Revelation 16, and the 144,000 Jewish servants are no longer on Earth - they are with the Lord in the heavenly Zion. We will discuss in the next few sections why the 144,000 Jewish servants are in Heaven before the Tribulation is over. Revelation 14:2 - And I heard a voice from heaven, like the voice of many waters, and like the voice of loud thunder. And I heard the sound of harpists playing their harps. Psalms 93:3-4 - The floods have lifted up, O LORD, the floods have lifted up their voice; the floods lift up their waves. The LORD on high is mightier than the noise of many waters, than the mighty waves of the sea. Jeremiah 51:16 - When He utters His voice - there is a multitude of waters in the heavens: "He causes the vapors to ascend from the ends of the earth; He makes lightnings for the rain; He brings the wind out of His treasuries." Ezekiel 1:24 - When they [the living creatures] went, I heard the noise of their wings, like the noise of many waters, like the voice of the Almighty, a tumult like the noise of an army; and when they stood still, they let down their wings. Ezekiel 43:2 - And behold, the glory of the God of Israel came from the way of the east. His voice was like the sound of many waters; and the earth shone with His glory. Psalms 18:13-14 - The LORD thundered from heaven, and the Most High uttered His voice, hailstones and coals of fire. He sent out His arrows and scattered the foe, lightnings in abundance, and He vanquished them. 1 Samuel 2:10 - The adversaries of the LORD shall be broken in pieces; from heaven He will thunder against them. The LORD will judge the ends of the earth. "He will give strength to His king, and exalt the horn of His anointed." Job 37:2-5 - Hear attentively the thunder of His voice, and the rumbling that comes from His mouth. He sends it forth under the whole heaven, His lightning to the ends of the earth. After it a voice roars; He thunders with His majestic voice, and He does not restrain them when His voice is heard. God thunders marvelously with His voice; He does great things which we cannot comprehend. Psalms 18:7-14 - Then the earth shook and trembled; the foundations of the hills also quaked and were shaken, because He was angry. Smoke went up from His nostrils, and devouring fire from His mouth; coals were kindled by it. He bowed the heavens also, and came down with darkness under His feet. And He rode upon a cherub, and flew; He flew upon the wings of the wind. He made darkness His secret place; His canopy around Him was dark waters and thick clouds of the skies. From the brightness before Him, His thick clouds passed with hailstones and coals of fire. The LORD thundered from heaven, and the Most High uttered His voice, hailstones and coals of fire. He sent out His arrows and scattered the foe, lightnings in abundance, and He vanquished them. Psalms 29:1-11 - A Psalm of David. Give unto the LORD, O you mighty ones, give unto the LORD glory and strength. Give unto the LORD the glory due to His name; worship the LORD in the beauty of holiness. The voice of the LORD is over the waters; the God of glory thunders; the LORD is over many waters. The voice of the LORD is powerful; the voice of the LORD is full of majesty. The voice of the LORD breaks the cedars, yes, the LORD splinters the cedars of Lebanon. He makes them also skip like a calf, Lebanon and Sirion like a young wild ox. The voice of the LORD divides the flames of fire. The voice of the LORD shakes the wilderness; the LORD shakes the Wilderness of Kadesh. The voice of the LORD makes the deer give birth, and strips the forests bare; and in His temple everyone says, "Glory!" The LORD sat enthroned at the Flood, and the LORD sits as King forever. The LORD will give strength to His people; the LORD will bless His people with peace. Psalms 77:16-20 - The waters saw You, O God; the waters saw You, they were afraid; the depths also trembled. The clouds poured out water; the skies sent out a sound; Your arrows also flashed about. The voice of Your thunder was in the whirlwind; the lightnings lit up the world; the earth trembled and shook. Your way was in the sea, Your path in the great waters, and Your footsteps were not known. You led Your people like a flock by the hand of Moses and Aaron. Ezekiel 3:12-13 - Then the Spirit lifted me up, and I heard behind me a great thunderous voice: "Blessed is the glory of the LORD from His place!" I also heard the noise of the wings of the living creatures that touched one another, and the noise of the wheels beside them, and a great thunderous noise. Revelation 6:1 - Now I saw when the Lamb opened one of the seals; and I heard one of the four living creatures saying with a voice like thunder, "Come and see." Revelation 19:6 - And I heard, as it were, the voice of a great multitude, as the sound of many waters and as the sound of mighty thunderings, saying, "Alleluia! For the Lord God Omnipotent reigns!" It is not clear if John hears the Lord's voice, or the voice of a group like the living creatures, or the voice of the great multitude in Heaven. John also hears the sound of harpists playing their harps in Heaven. Recall from Revelation 5:8, harps in the Bible were widely used in worship. Harps were also used in a few instances when men were prophesying (1 Samuel 10:5, 1 Chronicles 25:3). David's harp skills had the power to drive away distressing spirits from Saul (1 Samuel 16:16, 23). It is clear from these examples that music transcends from the physical realm into the spiritual realm. The twenty-four elders and the four living creatures represent the Church and Israel (Revelation 4:4 & 7), and those who have victory over the beast are the Tribulation saints (Revelation 20:4). All three groups are priests before the Lord (Exodus 19:6, 1 Peter 2:4-9, Revelation 1:6, 5:10, 20:6). Recall from Revelation 4:4, the musically talented Levites served in the temple. These priests prophesied and worshiped through music (1 Chronicles 25). So we see that the pattern on Earth is also found in Heaven, with musically gifted priests active in both the earthly temple and the heavenly throne. In short, John hears a voice that sounds like many waters and like thunder, which shows the power and might of the Lord, and may also speak of His justice as He is about to return to earth to judge the nations. John also hears the sound of harpists playing harps. The harpists could be any or all from the redeemed saints in Heaven, since Scripture shows that all the saints in Heaven are priests before the Lord who have harps. Psalms 33:1-3 - Rejoice in the LORD, O you righteous! For praise from the upright is beautiful. Praise the LORD with the harp; make melody to Him with an instrument of ten strings. Sing to Him a new song; play skillfully with a shout of joy. Psalms 149:1-9 - Praise the LORD! Sing to the LORD a new song, and His praise in the assembly of saints. Let Israel rejoice in their Maker; let the children of Zion be joyful in their King. Let them praise His name with the dance; let them sing praises to Him with the timbrel and harp. For the LORD takes pleasure in His people; He will beautify the humble with salvation. Let the saints be joyful in glory; let them sing aloud on their beds. Let the high praises of God be in their mouth, and a two-edged sword in their hand, to execute vengeance on the nations, and punishments on the peoples; to bind their kings with chains, and their nobles with fetters of iron; to execute on them the written judgment - this honor have all His saints. Praise the LORD! Revelation 15:2-3 - And I saw something like a sea of glass mingled with fire, and those who have the victory over the beast, over his image and over his mark and over the number of his name, standing on the sea of glass, having harps of God. They sing the song of Moses, the servant of God, and the song of the Lamb, saying: "Great and marvelous are Your works, Lord God Almighty! Just and true are Your ways, O King of the saints!" Revelation 5:9 - And they sang a new song, saying: "You are worthy to take the scroll, and to open its seals; for You were slain, and have redeemed us to God by Your blood out of every tribe and tongue and people and nation...."
Hebrews 9:11-12,15 - But Christ came as High Priest of the good things to come, with the greater and more perfect tabernacle not made with hands, that is, not of this creation. Not with the blood of goats and calves, but with His own blood He entered the Most Holy Place once for all, having obtained eternal redemption.... And for this reason He is the Mediator of the new covenant, by means of death, for the redemption of the transgressions under the first covenant, that those who are called may receive the promise of the eternal inheritance. 1 Timothy 2:5-6 - For there is one God and one Mediator between God and men, the Man Christ Jesus, who gave Himself a ransom for all, to be testified in due time. Luke 4:16-21 - So He came to Nazareth, where He had been brought up. And as His custom was, He went into the synagogue on the Sabbath day, and stood up to read. And He was handed the book of the prophet Isaiah. And when He had opened the book, He found the place where it was written: "The Spirit of the Lord is upon me, because He has anointed me to preach the gospel to the poor; He has sent me to heal the brokenhearted, to proclaim liberty to the captives and recovery of sight to the blind, to set at liberty those who are oppressed; to proclaim the acceptable year of the Lord." Then He closed the book, and gave it back to the attendant and sat down. And the eyes of all who were in the synagogue were fixed on Him. And He began to say to them, "Today this Scripture is fulfilled in your hearing." Jeremiah 31:11-12 - For the LORD has redeemed Jacob, and ransomed him from the hand of one stronger than he. Therefore they shall come and sing in the height of Zion, streaming to the goodness of the LORD for wheat and new wine and oil, for the young of the flock and the herd; their souls shall be like a well-watered garden, and they shall sorrow no more at all. Isaiah 35:10 - And the ransomed of the LORD shall return, and come to Zion with singing, with everlasting joy on their heads. They shall obtain joy and gladness, and sorrow and sighing shall flee away. Isaiah 51:11 - So the ransomed of the LORD shall return, and come to Zion with singing, with everlasting joy on their heads. They shall obtain joy and gladness; sorrow and sighing shall flee away. Ephesians 1:13-14 - In Him you also trusted, after you heard the word of truth, the gospel of your salvation; in whom also, having believed, you were sealed with the Holy Spirit of promise, who is the guarantee of our inheritance until the redemption of the purchased possession, to the praise of His glory. Romans 8:22-23 - For we know that the whole creation groans and labors with birth pangs together until now. Not only that, but we also who have the firstfruits of the Spirit, even we ourselves groan within ourselves, eagerly waiting for the adoption, the redemption of our body. Revelation 14:4 - These are the ones who were not defiled with women, for they are virgins. These are the ones who follow the Lamb wherever He goes. These were redeemed from among men, being firstfruits to God and to the Lamb. Deuteronomy 26:1-3, 10 - "And it shall be, when you come into the land which the LORD your God is giving you as an inheritance, and you possess it and dwell in it, that you shall take some of the first of all the produce of the ground, which you shall bring from your land that the LORD your God is giving you, and put it in a basket and go to the place where the LORD your God chooses to make His name abide.... I have brought the firstfruits of the land which you, O LORD, have given me. Then you shall set it before the LORD your God, and worship before the LORD your God." 1 Corinthians 15:20-24 - But now Christ is risen from the dead, and has become the firstfruits of those who have fallen asleep. For since by man came death, by Man also came the resurrection of the dead. For as in Adam all die, even so in Christ all shall be made alive. But each one in his own order: Christ the firstfruits, afterward those who are Christ's at His coming. Then comes the end, when He delivers the kingdom to God the Father, when He puts an end to all rule and all authority and power. 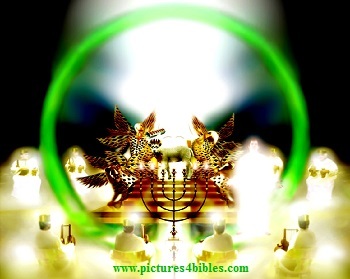 Revelation 20:4-6 - And I saw thrones, and they sat on them, and judgment was committed to them. Then I saw the souls of those who had been beheaded for their witness to Jesus and for the word of God, who had not worshiped the beast or his image, and had not received his mark on their foreheads or on their hands. And they lived and reigned with Christ for a thousand years. But the rest of the dead did not live again until the thousand years were finished. This is the first resurrection. Blessed and holy is he who has part in the first resurrection. Over such the second death has no power, but they shall be priests of God and of Christ, and shall reign with Him a thousand years. Proverbs 3:9-10 - Honor the LORD with your possessions, and with the firstfruits of all your increase; so your barns will be filled with plenty, and your vats will overflow with new wine. The 144,000 servants get redeemed to Heaven, but we don't know if they get translated alive or if they become martyrs after they finish their ministry and get resurrected like the two witnesses who were killed, resurrected, and then translated into Heaven in Revelation 11:7-12. As discussed in Revelation 7:3, the seal on the forehead of the 144,000 Jewish servants protects them from God's judgments through the Tribulation, but there is nothing in Scripture that shows that they will not die. Whether the 144,000 Jewish servants are alive or dead at the time of their resurrection and translation to Heaven, they are the first ones to get their resurrection bodies in the Tribulation, because they are firstfruits of the Tribulation soul harvest. Ephesians 1:7-10 - In Him we have redemption through His blood, the forgiveness of sins, according to the riches of His grace which He made to abound toward us in all wisdom and prudence, having made known to us the mystery of His will, according to His good pleasure which He purposed in Himself, that in the dispensation of the fullness of the times He might gather together in one all things in Christ, both which are in heaven and which are on earth - in Him. Matthew 8:19-22 - Then a certain scribe came and said to Him, "Teacher, I will follow You wherever You go." And Jesus said to him, "Foxes have holes and birds of the air have nests, but the Son of Man has nowhere to lay His head." Then another of His disciples said to Him, "Lord, let me first go and bury my father." But Jesus said to him, "Follow Me, and let the dead bury their own dead." Luke 9:57-62 - Now it happened as they journeyed on the road, that someone said to Him, "Lord, I will follow You wherever You go." And Jesus said to him, "Foxes have holes and birds of the air have nests, but the Son of Man has nowhere to lay His head." Then He said to another, "Follow Me." But he said, "Lord, let me first go and bury my father." Jesus said to him, "Let the dead bury their own dead, but you go and preach the kingdom of God." And another also said, "Lord, I will follow You, but let me first go and bid them farewell who are at my house." But Jesus said to him, "No one, having put his hand to the plow, and looking back, is fit for the kingdom of God." John 1:36-37 - And looking at Jesus as He walked, he said, "Behold the Lamb of God!" The two disciples heard him speak, and they followed Jesus. 24 ¶ Then Jesus said to His disciples, “If anyone desires to come after Me, let him deny himself, and take up his cross, and follow Me. 34 ¶ When He had called the people to Himself, with His disciples also, He said to them, “Whoever desires to come after Me, let him deny himself, and take up his cross, and follow Me. 35 For whoever desires to save his life will lose it, but whoever loses his life for My sake and the gospel’s will save it. 38 For whoever is ashamed of Me and My words in this adulterous and sinful generation, of him the Son of Man also will be ashamed when He comes in the glory of His Father with the holy angels.” 23 ¶ Then He said to them all, “If anyone desires to come after Me, let him deny himself, and take up his cross daily, and follow Me. Salvation - Trusting Jesus Christ by faith as your only means for eternal life and going to Heaven. It's a "born-again" experience facilitated by the empowering of the Holy Spirit by faith that delivers the Believer into God's family. An eternity-long covenant relationship is experienced between the Believer and God as a result. Click here to read, "What the Bible says about Eternal Life." Discipleship - The action of following and emulating the actions of Jesus. Interestingly enough, Judas was a disciple, but never experienced salvation (John 6:70, see notes). Special-purpose discipleship - The action of dropping everything one is doing, forsaking family ties and possessions and exclusively committing everything (all your resources) to the cause of ministering with Jesus in his earthly ministry. John 12:25-26 - He who loves his life will lose it, and he who hates his life in this world will keep it for eternal life. If anyone serves Me, let him follow Me; and where I am, there My servant will be also. If anyone serves Me, him My Father will honor. Exodus 34:13-17 - But you shall destroy their altars, break their sacred pillars, and cut down their wooden images (for you shall worship no other god, for the LORD, whose name is Jealous, is a jealous God), lest you make a covenant with the inhabitants of the land, and they play the harlot with their gods and make sacrifice to their gods, and one of them invites you and you eat of his sacrifice, and you take of his daughters for your sons, and his daughters play the harlot with their gods and make your sons play the harlot with their gods. "You shall make no molded gods for yourselves." 2 Corinthians 11:2 - For I am jealous for you with godly jealousy. For I have betrothed you to one husband, that I may present you as a chaste virgin to Christ. Ezekiel 37:23 - They shall not defile themselves anymore with their idols, nor with their detestable things, nor with any of their transgressions; but I will deliver them from all their dwelling places in which they have sinned, and will cleanse them. Then they shall be My people, and I will be their God. 1 Corinthians 7:26-28 - I suppose therefore that this is good because of the present distress - that it is good for a man to remain as he is: Are you bound to a wife? Do not seek to be loosed. Are you loosed from a wife? Do not seek a wife. But even if you do marry, you have not sinned; and if a virgin marries, she has not sinned. Nevertheless such will have trouble in the flesh, but I would spare you. 1 Corinthians 7:29-31 - But this I say, brethren, the time is short, so that from now on even those who have wives should be as though they had none, those who weep as though they did not weep, those who rejoice as though they did not rejoice, those who buy as though they did not possess, and those who use this world as not misusing it. For the form of this world is passing away. 1 Corinthians 7:32-35 - But I want you to be without care. He who is unmarried cares for the things of the Lord - how he may please the Lord. But he who is married cares about the things of the world - how he may please his wife. There is a difference between a wife and a virgin. The unmarried woman cares about the things of the Lord, that she may be holy both in body and in spirit. But she who is married cares about the things of the world - how she may please her husband. And this I say for your own profit, not that I may put a leash on you, but for what is proper, and that you may serve the Lord without distraction. Matthew 19:11-12 - But He said to them, "All cannot accept this saying, but only those to whom it has been given: For there are eunuchs who were born thus from their mother's womb, and there are eunuchs who were made eunuchs by men, and there are eunuchs who have made themselves eunuchs for the kingdom of heaven's sake. He who is able to accept it, let him accept it." Psalms 24:3-4 - Who may ascend into the hill of the LORD? Or who may stand in His holy place? He who has clean hands and a pure heart, who has not lifted up his soul to an idol, nor sworn deceitfully. Revelation 14:5 - And in their mouth was found no deceit, for they are without fault before the throne of God. 1 Peter 1:18-19 - ...knowing that you were not redeemed with corruptible things, like silver or gold, from your aimless conduct received by tradition from your fathers, but with the precious blood of Christ, as of a lamb without blemish and without spot. Jude 1:24-25 - Now to Him who is able to keep you from stumbling, and to present you faultless before the presence of His glory with exceeding joy, to God our Savior, who alone is wise, be glory and majesty, dominion and power, both now and forever. Amen. Isaiah 53:5-8 - But He was wounded for our transgressions, He was bruised for our iniquities; the chastisement for our peace was upon Him, and by His stripes we are healed. All we like sheep have gone astray; we have turned, every one, to his own way; and the LORD has laid on Him the iniquity of us all. He was oppressed and He was afflicted, yet He opened not His mouth; He was led as a lamb to the slaughter, and as a sheep before its shearers is silent, so He opened not His mouth. He was taken from prison and from judgment, and who will declare His generation? For He was cut off from the land of the living; for the transgressions of My people He was stricken. Isaiah 53:9-11 - And they made His grave with the wicked - but with the rich at His death, because He had done no violence, nor was any deceit in His mouth. Yet it pleased the LORD to bruise Him; He has put Him to grief. When You make His soul an offering for sin, He shall see His seed, He shall prolong His days, and the pleasure of the LORD shall prosper in His hand. He shall see the labor of His soul, and be satisfied. By His knowledge My righteous Servant shall justify many, for He shall bear their iniquities. Matthew 12:34 - Brood of vipers! How can you, being evil, speak good things? For out of the abundance of the heart the mouth speaks. Matthew 15:7-11 - Hypocrites! Well did Isaiah prophesy about you, saying: 'These people draw near to me with their mouth, and honor me with their lips, but their heart is far from Me. And in vain they worship Me, teaching as doctrines the commandments of men.' "When He had called the multitude to Himself, He said to them, "Hear and understand: Not what goes into the mouth defiles a man; but what comes out of the mouth, this defiles a man." Matthew 15:17-20 - Do you not yet understand that whatever enters the mouth goes into the stomach and is eliminated? But those things which proceed out of the mouth come from the heart, and they defile a man. For out of the heart proceed evil thoughts, murders, adulteries, fornications, thefts, false witness, blasphemies. These are the things which defile a man, but to eat with unwashed hands does not defile a man." Psalms 10:3-7 - For the wicked boasts of his heart's desire; he blesses the greedy and renounces the LORD. The wicked in his proud countenance does not seek God; God is in none of his thoughts. His ways are always prospering; Your judgments are far above, out of his sight; as for all his enemies, he sneers at them. He has said in his heart, "I shall not be moved; I shall never be in adversity." His mouth is full of cursing and deceit and oppression; under his tongue is trouble and iniquity. Revelation 13:5-6 - And he was given a mouth speaking great things and blasphemies, and he was given authority to continue for forty-two months. Then he opened his mouth in blasphemy against God, to blaspheme His name, His tabernacle, and those who dwell in heaven. Daniel 8:25 - "Through his cunning he shall cause deceit to prosper under his rule; and he shall exalt himself in his heart. He shall destroy many in their prosperity. He shall even rise against the Prince of princes; but he shall be broken without human means. John 8:44 - You are of your father the devil, and the desires of your father you want to do. He was a murderer from the beginning, and does not stand in the truth, because there is no truth in him. When he speaks a lie, he speaks from his own resources, for he is a liar and the father of it. Psalms 15:1-5 - A Psalm of David. LORD, who may abide in Your tabernacle? Who may dwell in Your holy hill? He who walks uprightly, and works righteousness, and speaks the truth in his heart; he who does not backbite with his tongue, nor does evil to his neighbor, nor does he take up a reproach against his friend; in whose eyes a vile person is despised, but he honors those who fear the LORD; he who swears to his own hurt and does not change; he who does not put out his money at usury, nor does he take a bribe against the innocent. He who does these things shall never be moved.